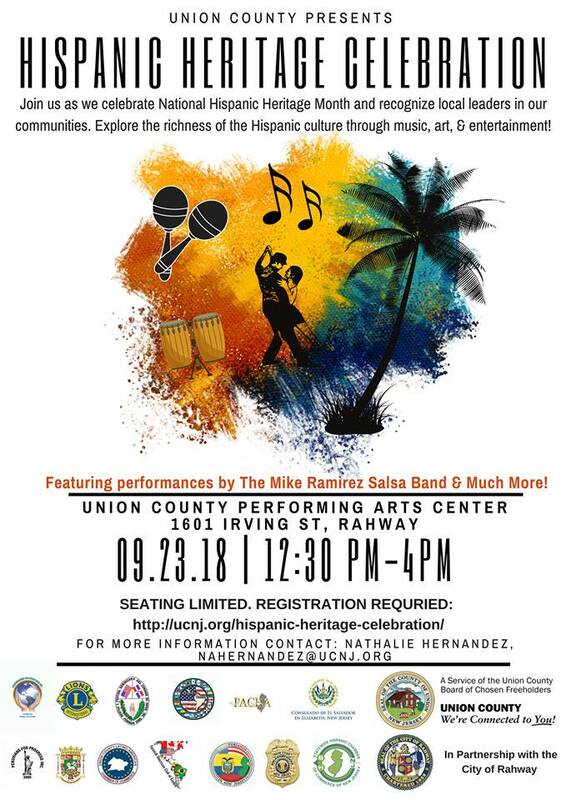 Union County, NJ – The Union County Board of Chosen Freeholders invites the community to join the County’s first Hispanic Heritage Celebration on Sunday, September 23rd, from 12:30 p.m. to 4:00 p.m. at the Union County Performing Arts Center, 1601 Irving Street in Rahway. The Freeholder Board is partnering with the City of Rahway for the event, which is free and open to the general public. The event is free but pre-registration is requested. To register, use the online form at ucnj.org/hispanic-heritage-celebration. The event includes live performances, an awards ceremony, food tastings and more. Public parking is available at the Performing Arts Center’s Hamilton Stage location nearby, at 360 Hamilton Street. Attendees are invited to explore the richness of the Hispanic culture through various musical and dance performances, art and entertainment. The day’s activities will be capped off with a performance by the Mike Ramirez Salsa Band. Chairman Granados will be joined by Freeholder Angel Estrada to present the awards, along with local officials. The Hispanic Heritage Month event is coordinated through the Union County Office of Community Engagement and Diversity. The office is part of Freeholder Chairman Granados’s 2018 “Moving Union County Forward” initiatives for supporting inclusion, individual empowerment and community engagement in Union County. For more information please contact the office coordinator, Nathalie Hernandez, at nahernandez@ucnj.org or 908-527-4880.